Hard to believe, but this is my first growler. I don't think they have been legal in Texas for a long time. This is filled with Three Nations Octoberfest. Pretty good stuff. This one has been in my refrigerator for a while now, and I kept putting off sampling it for a variety of reasons. But tonight, I finally decided to pop the top on New Republic Brewing Co.'s Dammit Jim Amber. I'd love to say it was totally worth the wait, but I can't. I can say that it's not a disappointment, though. This seems to bee a very serviceable amber. It's got a pleasant but unremarkable aroma. The color is beautiful -- nice, sparkling brown with hints of golden honey. It would have been nice if the color made it to the taste. Again, there's not too much to report about here. It's a solid amber with just a hint of tartness; there may be just a hint of citrus, but I could be wrong. As it warmed, my scanners did detect traces of malt and toffee trying to come to the surface. I think if you were trying to get a young Trekkie to taste a craft beer for the first time, you could definitely do worse than beaming down a tall one of this beer. 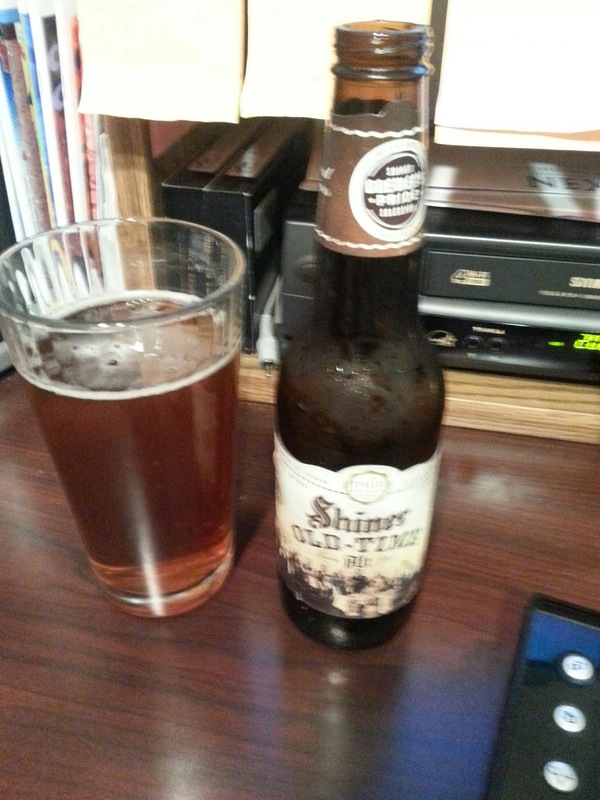 And tall one it is – the bottle I bought (probably at a NW Houston Spec's Liquor) is 1 pint 6 ounces. That's a lot of beer, but with an ABV of only 5.6%, even drinking the whole thing probably won't make you too buzzed to operate a shuttle craft (but not your car). Carbonation is medium (and a little more than I normally get in a simple amber). Mouthfeel is good, if not a little on the dry side for my taste. 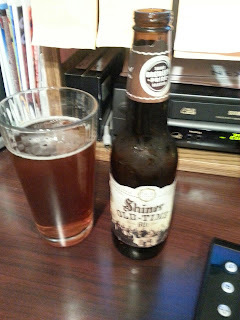 All in all, a solid beer from the nice folks in College Station, Texas. This beer tickled my nose with such a scent of strawberries that I was almost disappointed that it wasn't pink. But no, as the name declares, this is a blonde -- a strawberry blonde. It poured with a delightful, crisp golden wheat color and a generous head. I was surprised at how quickly it dissipated, leaving almost no lace behind. I was also surprised that, ice cold, it actually didn't have a cloying strawberry sweetness that I was expecting from the strength of the aroma. 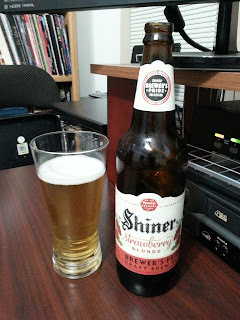 Shiner Strawberry Blonde is the seventh experiment to spring from their "Brewer's Pride" collection of small-run beers and ales. I paid about $4 for a 1 pint 8 fl oz (in other words, 24 oz) bottle at my local Randall's in NW Houston. I understand it is also available in 12 oz bottles in Shiner's Family Reunion Pack (their half-case sampler). This strawberry is no cheesecake! It has a 4.3% ABV and is crisp on the tongue with little aftertaste. The predominant notes were malt and strawberry, which coexisted in a sweet (but not too sweet) balance. The one thing I really did like about this was that it was clearly a beer, and not a wine cooler. The beer was forefront with the sweet malt carrying the strawberry flavor, and not the other way around. I'm usually not a big fan of fruit beers, but this one is definitely an exception. here in Houston, even an unusually mild August doesn't really mean that Autumn is on the breeze. There will still probably be a lot of sweltering days and nights ahead before The Great Pumpkin rises out of his patch. That doesn't stop the brewers and distributors from jumping the gun and getting their October brews on the shelves. The first one I tapped this year (and as you may have read, I'm not tapping nearly as many as I used to) is from the Nebraska Brewing Company: Wick for Brains. I have to admit, most of the reason I picked it up was the cool and fun can design. Something about that wicked Jack peering out at me was just too fun to resist. So I didn't. How could I resist Jolly Jack on this can? I bought a six-pack at a local Kroger for about $8.50. A bit pricey, but certainly not too pricey. I served it ice cold and, popping the top (it's hard to describe it, but the pop top is actually unusual, in that it doesn't pop a hole, but rather shoves down a flap) I was rewarded with one of the stronger pumpkin and spice smells I've encountered in a long time. It was so strong it almost evoked a sense memory of spice cookies baking in the oven. It was very pleasant. Ichabod's horseman and this ale have a lot in common. What was not so pleasant was the head -- or lack thereof -- when I poured it. In terms of headlessness, Ichabod Crane's nemesis and this aggressive pour had a lot in common: it was pretty much headless. I had to do a very aggressive pour to get any head at all, and then it faded leaving no lace at all. Whereas the head was missing, aroma and taste were not. The first sip was a rewarding mix of malty ale and the expected pumpkin spices (allspice, nutmeg, cinnamon) -- but only more so. 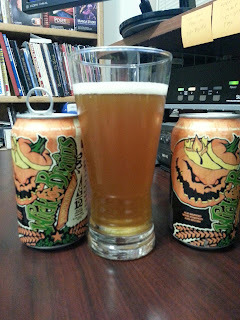 I've had a lot of pumpkin ales over the years, and some were quite good, but this is one of the best of its kind. The pumpkin takes front and center stage, but it's not pulling some gimmicky diva act. This is a star and knows how to work with the rest of the ensemble. In other words, the flavors are strong but balanced. And wonderfully so, especially in a beer this strong: It has an ABV of 6.1%. 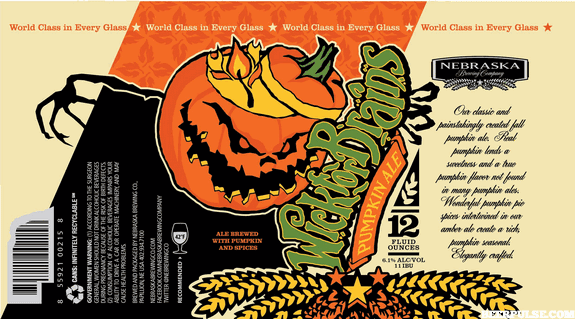 Wick for Brains is our classic and painstakingly produced Fall Pumpkin Ale. Instead of simply using spice, we use real pumpkin which lends a sweetness and pumpkin flavor not found in many Pumpkin Ales. Wonderful pumpkin pie spice intertwined in an Amber Ale creates a pumpkin sensation which is elegantly crafted. Notes of Cinnamon, Nutmeg, Clove, Ginger and Allspice blend perfectly in this seasonal Ale. 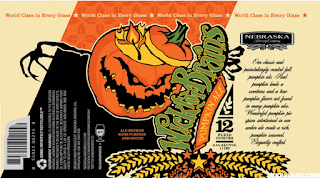 There are many Pumpkin Ales out there crafted by some wonderful breweries – we feel that ours stands among them and in some cases – stands apart. This is a seasonal, so if you spot a six-pack, I strongly suggest you grab one and head to the nearest, most-sincere pumpkin patch you can find. Play some haunting tunes by Midnight Syndicate and enjoy the night. 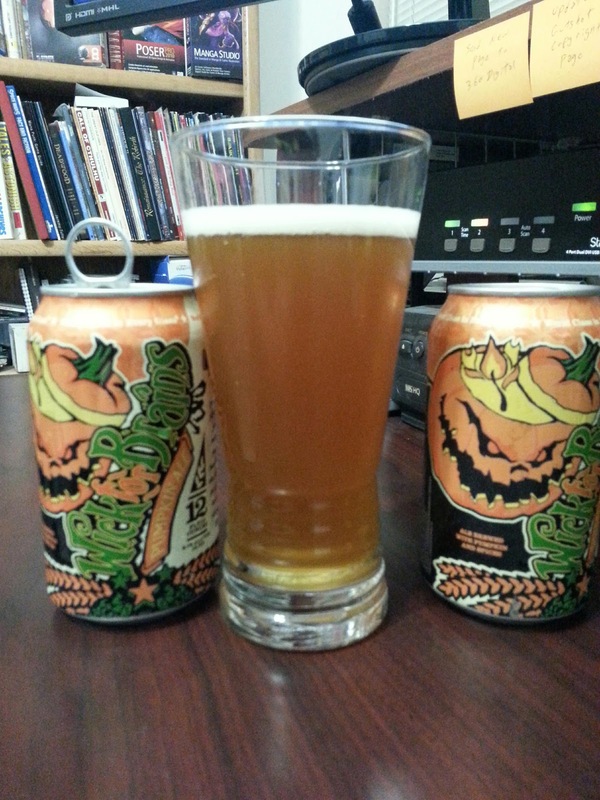 You don't actually have to wait for The Great Pumpkin to arrive. He already has -- in this can or bottle. This blog isn't exactly dead, but it may continue to be on hold for a while more. In the past year, I've gone on a medication that requires I restrict my alcohol consumption. Until we know how it's working with my liver, I am not drinking. And yes... that's about as horrible as it sounds. If things change, I shall resume this blog. If not... well... it was a fun ride while it lasted. I don't know how long this one has been in my upstairs beer fridge. Probably a year, but it could be a little more than that. 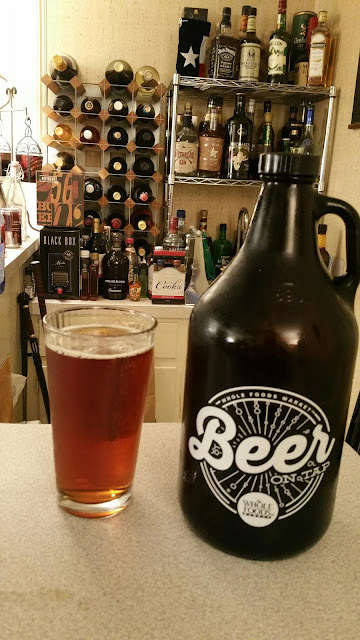 So, you need to take this review with a bit of caution -- I might be talking about old beer here. That being said, I'm very sorry I let this one sit so long. It's really very good and has a lot of depth. If this were not part of their Brewer's Pride collection (and thus a limited edition), I would head out this weekend too but some more to do a proper review. As it is, I'll just share my Quick Sip thoughts with you. This has a beautiful color: copper with a sweet red hue. The aroma is a combination of spicy malt and heady yeast (the latter I ascribe to age, not brewer's intent). Both of these carry through into the flavor palette, and provide a refreshing and very broad base flavor. I find this to be a really good winter beer. The sweet malt is dominant over the hops, and the strong spices definitely take precedence over the faintly aromatic hops. All in all, the flavor is a rich pageant of fun flavors that are -- for the most part -- working together in harmony. It has a slightly dry mouth feel (especially for a beer with a 4.2% ABV) that I am uncertain as to whether it comes from the age or from the beer. It probably has something to do with the strong yeast flavor. I think I got this as part of a family reunion pack, which is their name for a sampler. I'm going to keep my eyes open to see if I can find another sample of this beer. I like it enough that I want to know more about it. My score: 7 out of 10. A Quick Comment: This beer got quite a few interesting descriptions from the guys over at Beer Advocate. I cannot deny that the name was part of the reason I bought this little beer. I mean, what a cool Rolling Stones reference. But, I have to admit I didn't go into this with very high hopes because I have not really enjoyed a lot of the beers offered from Oskar Blues Brewery. I mean, I don't hate their stuff, but in general I have not been that impressed. I was hoping to be proven wrong this time, but that was not to be. There is absolutely nothing wrong with this beer. It is a nice, refreshing little pilsner, definitely the sort of thing to chill you out more than get you hopped up (especially since it has a very mild hop profile, which is NOT a bad thing for me -- I don't like hops for the sake of hops). It's just nothing special. It's a nice pilsner, the sort that is perfect for a hot summer afternoon. But that's all there is. So, let's break it down: Not much of an aroma. There is almost no head (although it does leave a fine lace). The color is a testament to truth in advertising: it is VERY yellow. The carbonation is very light, and it does have a floral mouthfeel. This pairs okay with Mexican food and beef. It's low 5.3% ABV doesn't leave any strong alcohol flavors, so I imagine it will pair fairly well with just about any food. So, in closing, I doubt I'll buy this again, but you never know. It's definitely a non-threatening beer, so if I'm faced with a tricky food pairing, I could be tempted to give this one another try. 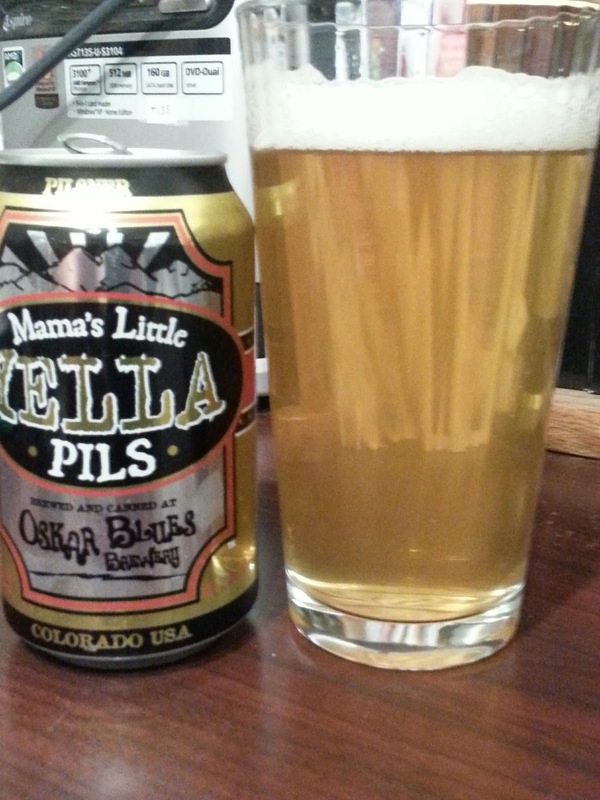 From their Website:Oskar Blues’ Mama’s Little Yella Pils is an uncompromising, small-batch version of the beer that made Pilsen, Czech Republic, famous. Unlike mass market “pilsners” diluted with corn & rice, Mama’s is built with 100% pale malt, German specialty malts, and Saaz hops. 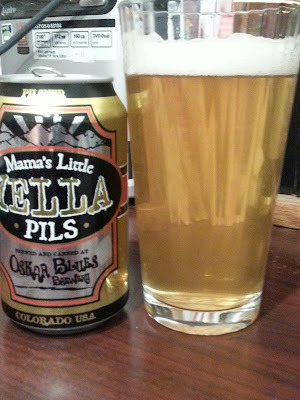 While its rich with Czeched-out flavor, its gentle hopping (35 IBUs) and low ABV (just 5.3%) make it a luxurious but low-dose (by Oskar Blues standards) refresher. I'm not a professional beer critic. I'm just a guy who likes a few beers every now and then. So, don't expect any in-depth discussions about the differences between mountain hops versus whatever other kind of hops are out there. Just expect me to write some honest reviews of what I do (and do not) like. The only rule I'm following is that I'm focusing on new beers -- that is to say, they are new to me. Unless I specifically say otherwise, everything I write is about a beer I have never had before. All contents copyright 2010 by Mike Mitchell. All rights reserved. Travel theme. Theme images by billnoll. Powered by Blogger.